How do I choose the perfect frame? We’ve drummed up several bits of information to help you choose the perfect frame. First, learn to identify your face shape here. Then, read this article to figure out your coloring. The face shape you have will determine which frame shapes will be most flattering on you, and knowing whether you’re cool or warm coloring will aid in choosing the perfect color frame. And remember, you can try on as many frames as you would like by using the Virtual Mirror. You can even share pictures with your family and friends, and ask them to vote on them via Facebook or email! I don’t understand how frame sizes work. Most glasses have the size engraved on the inside of one of the temples, or behind the bridge of the glasses. Frame sizes are written like this: 55-19-140, although sometimes a square (□) is used instead of a dash between the first and second number. The first number concerns lens width: Measured from the outermost edges of the lenses horizontally. Our example size has a lens width of 55 mm. The middle number measures bridge size, or more specifically: The distance between the lenses. The bridge width of our example is 19 mm. The last number expresses temple length: Length of the temple piece (a.k.a. arm or ear piece). The temple is 140 mm long in our example. Read more about frame sizes here. How do I know if the frame will fit? The first step in selecting a frame that will fit, is selecting a frame with a size similar to your old pair of comfy glasses. Read more about frame sizes here. The second, most important step, is to upload your fitting pictures after you pay for your glasses. By taking a few simple pictures of yourself and your glasses, our lab can figure out exactly how to pre-adjust your frame to your face. And these pictures will make sure that your lenses are fitted correctly into your frame as well. Instructions for taking these pictures and more can be found here. How can I recognize a frame that fits bifocal and/or progressive lenses? 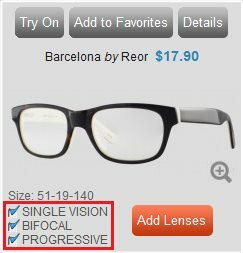 You can identify frames that can fit bifocal and progressive lenses in them by the check marks next to "Bifocal" and "Progressive" when hovering over the frame on the search results page.